Hey Music Lovers in the Mother City. My name is Riaan and my passion is to unlock the mysteries of 6 strings on a piece of wood. I’m the current head of guitar department at legacy school of music. The guitar department is focused on developing sound harmonization, melodic and rhythm skills as applied in all forms of contemporary music today. We also assist students in formal qualifications such as trinity college of London grades in theory and practical. On a personal level my musical interest reads like a packet of licorice all sorts,ranging from jazz,classical, flamenco and latin, african, blues,funk,folk and rock guitar styles. I also have a deep curiosity for ethnic music around the world from Persia to ancient china and the syncopated rhythms of Africa. 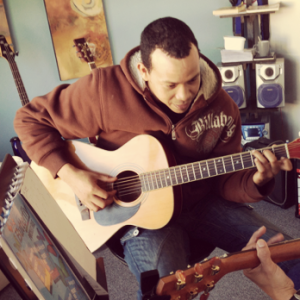 Our guitar department’s goal is to provide quality music education to the communities in western cape and further embed the culture of performing arts within our communities to provide a springboard for the talented pool of people in Western cape into the world of music. It Begins Here. The lessons offered within our guitar program cover everything from basic guitar to advanced soloing techniques, and caters for anyone, from the guitarist just wanting to play for friends to the rock star in the making. Even though we follow a basic curriculum to move you from the beginner stages and up the ranks of the guitar greats, our lessons are still flexible enough to be structured to your needs, whether that be playing around a camp fire, shredding guitar solos or even tasteful blues licks. The Guitar class is fully equipped with its own guitar gear necessary for getting you started should you not own your own gear. For beginner kiddies we have the basic Santa Fe acoustic nylon string guitar and for the more advanced guitar enthusiast we have the Takamine steel string guitar. For the electric rock star we have the Line 6 Spider 75 watt amplifier with built in effects to develop all the standard pedal tones such as clean, distortion, delay etc.On bass we have the Ibanez Geo bass guitar at the disposal of the student as well as the Ashdown 350 Watt bass amp. Rockschool exams are taught and offered within the class. Rockschool is used in the early stages of the students development to work on band skills within the individuals playing. This is then taken to the main stage in our live performance hall should the student wish to perform.